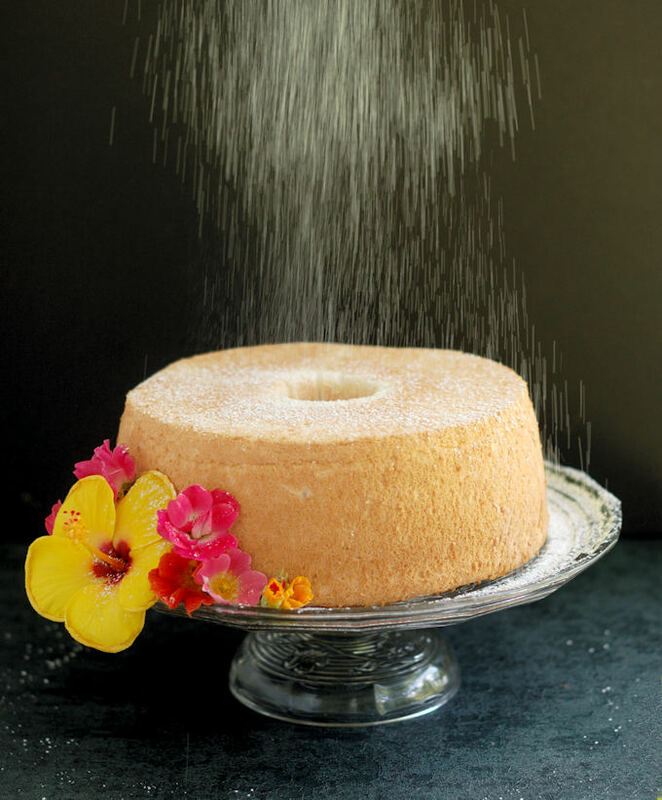 Light as a feather, not too sweet, tender and moist Angel Food Cake is possible with the right ingredients and, especially, with the right technique. 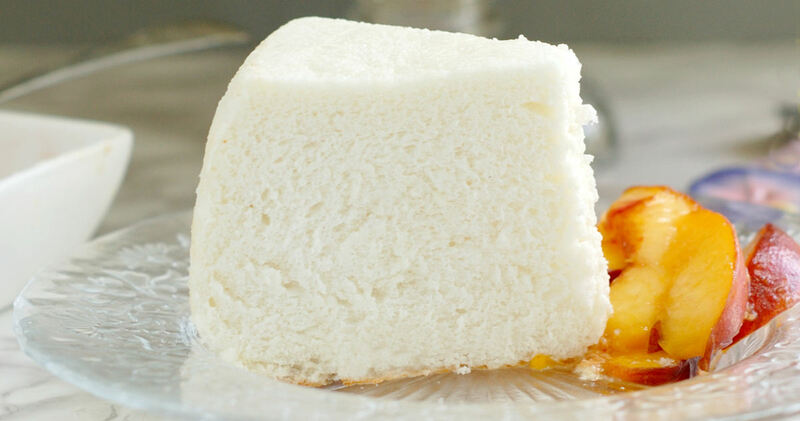 If ambrosia is the food of the gods, then I guess Angel Food Cake is the food of the angels. No offense to anyone who likes it, but if you’ve ever eaten ambrosia salad you probably figure the angels got the better end of that deal. 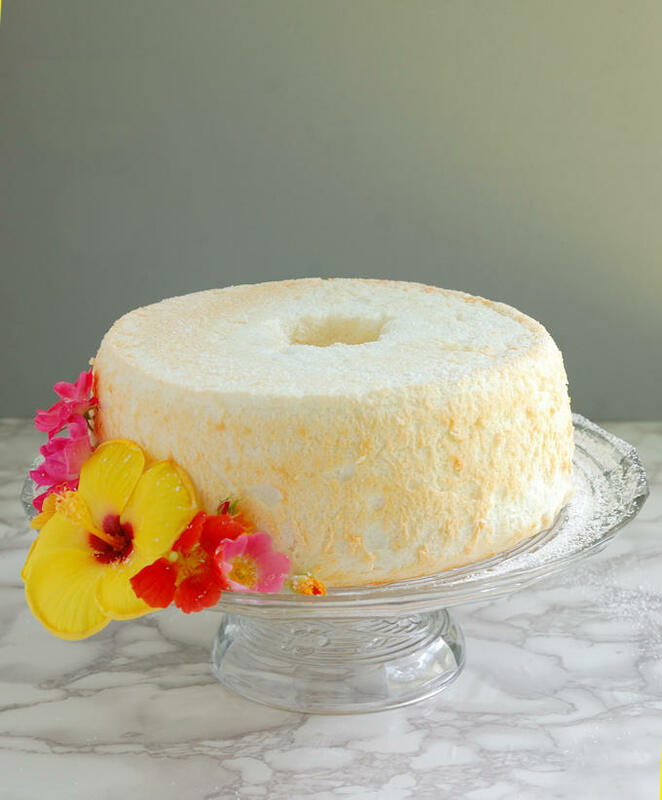 It had been years and years since I made an Angel Food Cake. It’s not a cake used in wedding cakes, so I never baked them for my cake business. 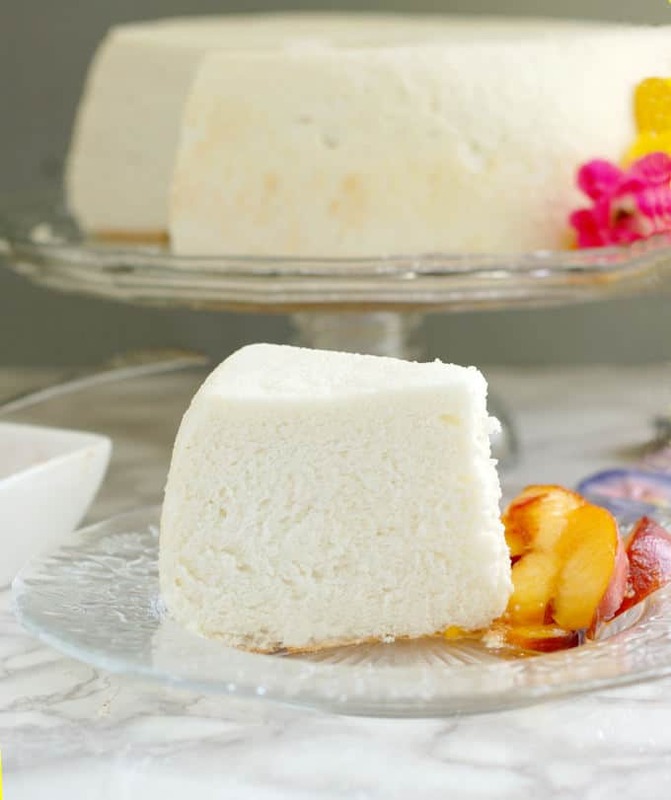 My memory of Angel Food Cake was generally of a rubbery, overly sweet and bland cake. No wonder I wasn’t anxious to bake one. Well, not any more. Despite baking and taste testing this recipe 8 times, I’m not sick of this cake at all. I think the simple flavor of this cake is what I’m attracted to at this point. 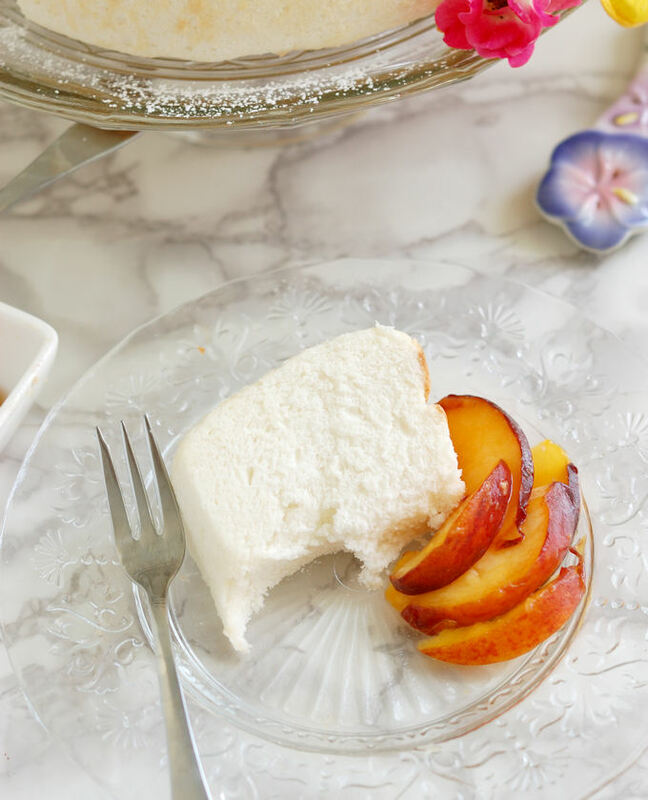 It’s the perfect partner for fresh, seasonal fruit, which is pretty much my favorite food. 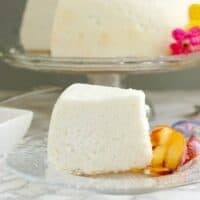 The catalyst for my Angel Food Cake experiments was a question I asked in my private Facebook Group (ask to join and I’ll add you to the group). 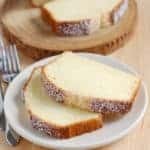 The question was “What is one baking technique or recipe that consistently gives you trouble?” A number of members mentioned Angel Food Cake. Coincidentally, I happened to have a whole bunch of frozen egg whites (leftover from my month long celebration of ice cream) taking up space in my freezer. It was the perfect time to bake a whole bunch of Angel Food Cakes. Ok, so before we do anything else, lets talk about the egg whites. 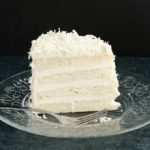 You’ve got to use fresh egg whites, not pasteurized egg whites from a carton. 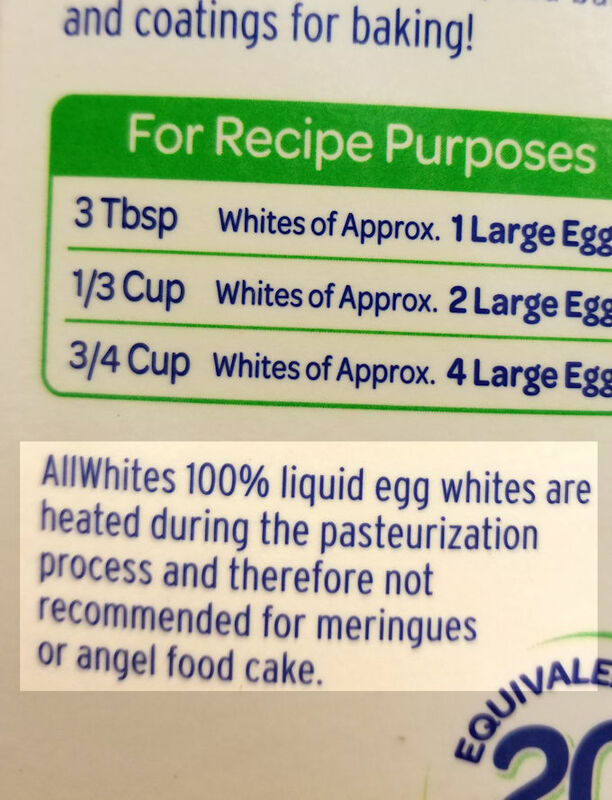 As you can see from this label, pasteurized whites can’t be used for making meringues or angel food cake. I know it’s a bit of a pain to end up with a dozen yolks left over, but the yolks can be frozen. You can also use fresh frozen whites since they are not pasteurized. 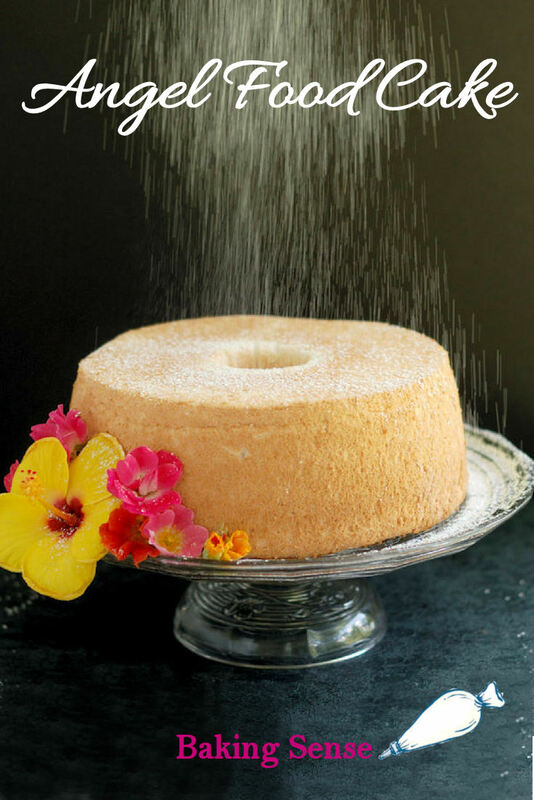 I set out to find out where the pitfalls might be in baking a great Angel Food Cake. The first step was to come up with a basic recipe. 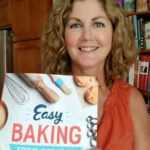 A little research showed that almost all the published recipes are very similar. So that was my starting point. The first small change I made was to add a little water to the batter. 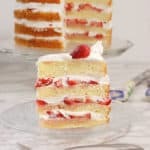 When I was making the white sponge cake for my Peppermint Stripe Cake Roll, I found a little water softened the cake and prevented it from becoming rubbery. I baked my new recipe once and knew right away that it was a good one. Time for the fun part, my fellow baking geeks. This is when we starting experimenting. Let’s break this recipe to see why it works. 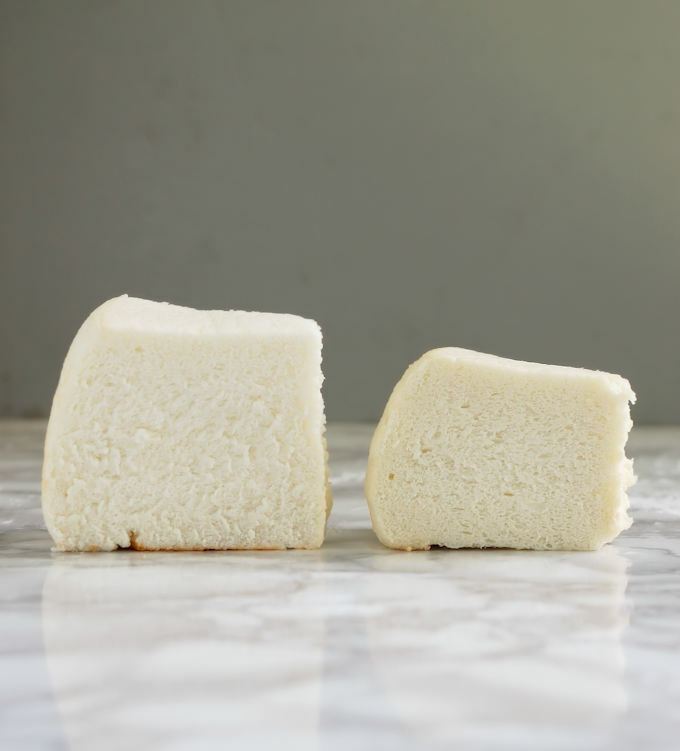 Two of the chief complaints I hear about Angel Food Cake is that it can be too sweet and a little dry. My first experiment was to try adding a little corn syrup to the batter. Corn syrup is less sweet than table sugar and, of course, is liquid. So I made a second cake replacing a 1/4 cup of the sugar with corn syrup, leaving out the water. NOPE! The cake was more dense than my original recipe. The heavy syrup collapsed the meringue too much during folding. Since it was no less sweet or more moist than my original cake there was no reason to follow this idea any further. Cross corn syrup off the list. I knew the water was doing good things for the cake, but I wanted to experiment with how much water was the right amount. I made another cake leaving out the water all together, and one more increasing the water to 1/2 a cup. The cake without water definitely tasted drier than my original and wasn’t as soft. Increasing the water to 1/2 cup made the cake too moist. It became gummy and squishy. Ok, 1/4 cup is the right amount of water. As we’ve seen many times here at Baking Sense, how a recipe is mixed can be as important as which ingredients you use. 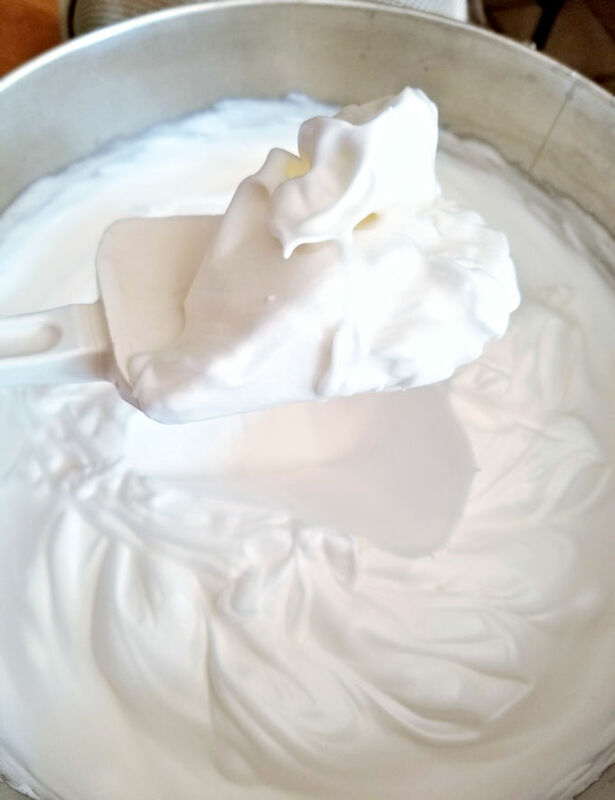 I was taught in pastry school a specific way to get the best volume and texture in a meringue; whip the meringue at medium speed until soft peaks form, slowly add the sugar, then increase the speed to medium high until full peaks form. The process takes about 8-10 minutes. That’s exactly how I whipped the whites for my original cake and I got a beautiful, silky meringue that didn’t collapse when the flour was folded in. For my next experiment I started the egg whites right off at the fastest speed, dumped the sugar in all at once and whipped until full peak. It only took about 3-4 minutes. Making the merignue on high speed could potentially shave a good 5-6 minutes off the recipe time. The high-whip meringue had great volume, but as you can see from these photos, the medium-speed meringue was silky smooth and the high-speed meringue was coarser. Whipping on high speed created larger bubbles which, in the baked cake, made for a coarser texture. Whipping the meringue for 8-10 minutes on medium/medium high speed resulted in a silky meringue. Whipping the whites on high resulted in a meringue with large bubbles and a cake with coarse texture. I also did a test using a hand mixer rather than my stand mixer. I’m sorry to say, but the texture of the cake made with hand mixer was a little more rubbery than the original cake. If you only own a hand mixer you can make a pretty good cake anyway. But in all honestly, the stand mixer does a better job. 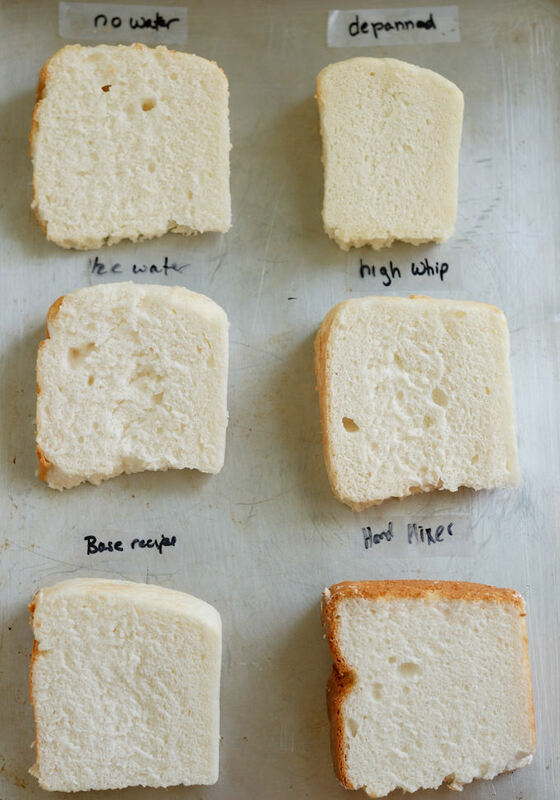 Over all the Angel Food Cake experiments, the most drastic difference happened in the last test. 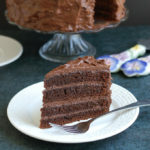 All recipes, including mine, direct you to bake the cake in an ungreased pan. The batter will stick to the ungreased pan while it bakes and after it comes out of the oven. Usually you don’t want a cake to stick to the pan, but it’s essential for this recipe. Since the baked cake is stuck to the bottom (and sides and middle) of the pan, you can flip the pan over onto the cooling rack as soon as it comes out of the oven. 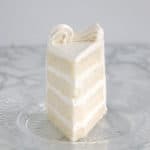 This cake has a very delicate texture when it’s warm so it needs the pan to help it stay in place until it is completely set. You can see the difference between the two cakes in the photo. The tall cake was completely cooled, upside down, in the pan. The shorter cake was removed from the pan after about 10 minutes, while it was still warm. Same recipe, same mixing technique, two totally different results. The cake on the right was removed from the pan while still warm. 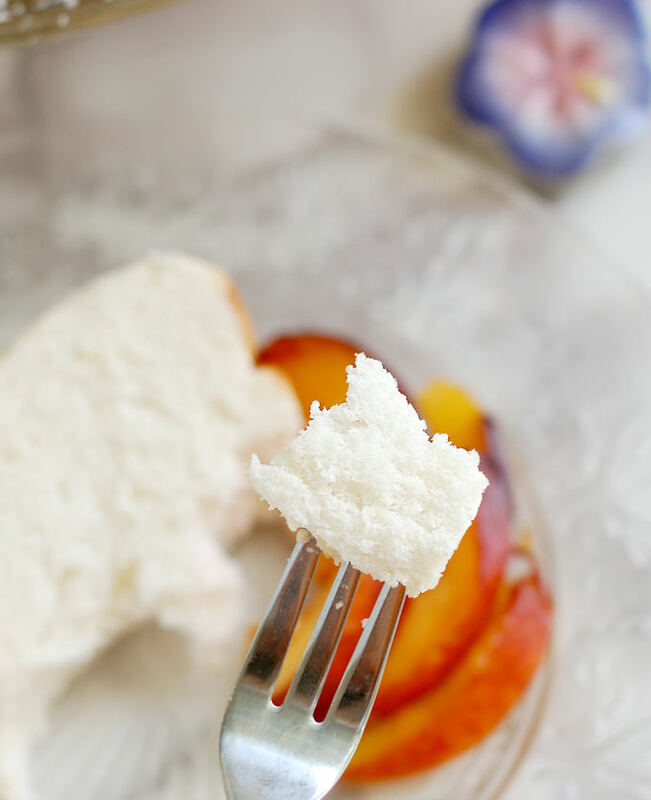 Use fresh egg whites, not pasteurized. Frozen fresh whites are fine. The cakes from all my experiments. The base recipe made the best cake. 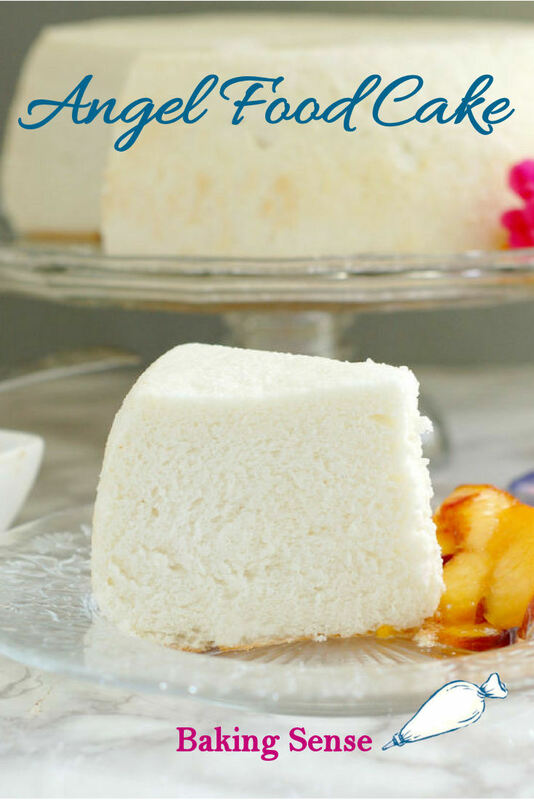 Watch the recipe video to see how to make a perfect Angel Food Cake. Preheat the oven to 350F. Have a 10" tube pan, ungreased, ready for the batter. Into a medium bowl sift the flour, 3/4 cup sugar and the salt. Whisk the ingredients together to distribute the salt and sugar evenly. Set aside. 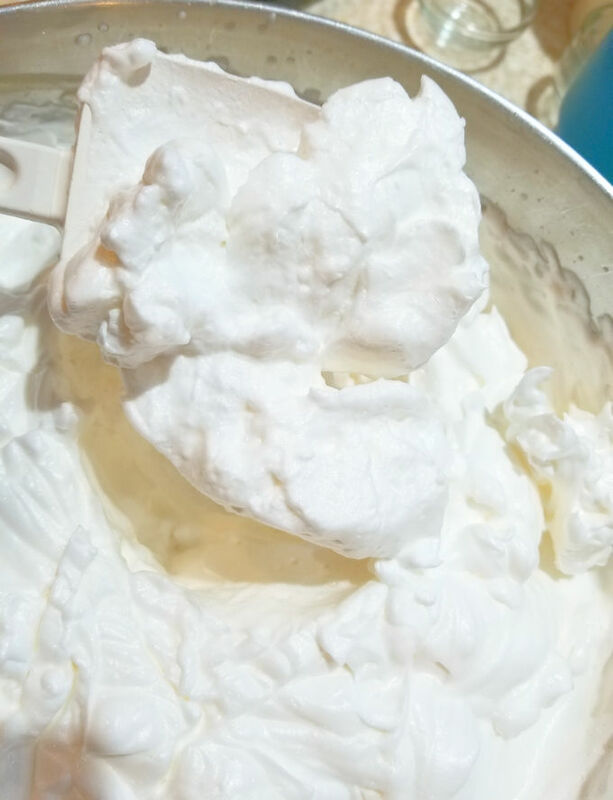 In a large mixer bowl or in the bowl of a stand mixer, whisk the egg whites on medium speed (#6-7) until frothy. Add the cream of tartar and continue whipping until soft peaks form. With the mixer running, gradually add the remaining 3/4 cup of sugar. Increase the speed to medium-high (#7-8) and continue whipping until stiff peaks are formed. The total whipping time will be about 8-10 minutes. Add the vanilla and the water and whip back to full peak. Sift 1/3 of the flour mixture over the meringue and use a spatula to fold in the flour until it's almost incorporated. Sift and fold in the remaining flour mixture in two batches. Fold just until all the flour is incorporated. The batter will still be quite fluffy. Scoop the batter into the tube pan and spread to even layer. 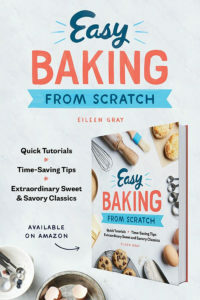 Bake until the cake is lightly browned and springs back when pressed or a toothpick inserted in the center comes out clean, about 35-40 minutes. Remove the pan from the oven and immediately invert the pan over a cooling rack. Leave the pan inverted until the cake is completely cool. 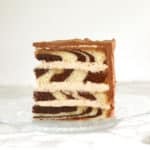 Run a small spatula or paring knife around the sides of the cake to loosen and release the cake from the pan. The cake will keep, well-wrapped, at room temperature for several days.